In Yoga texts, there is a focus on concentration (dharana) and meditation (dhyana), but not so much on ‘relaxation’ as a practice. I think that the lack of talk about ‘relaxation’ in these texts is mostly due to the change in our lifestyles and our mind as the time has passed. At one point, relaxation was probably unnecessary. Our minds were not distracted, our minds were not restless. Our minds were sharp, ready to practice concentration and meditation. We live in the age now where our minds are always thinking. Our minds are like a ball, rolling-rolling-rolling, picking up speed and constantly thinking and moving, restless and distracted. Relaxation serves to slow the ball down and even stop it to stillness, the achieve a ‘transquility’ in preparation for concentration and meditation. The goals of relaxation is, well, relaxing – letting go of tension. 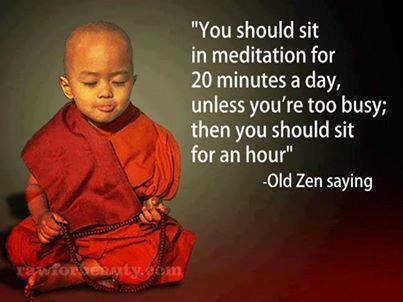 The goal of meditation is much more than that. Meditation is moving beyond relaxation, to a deeper level of awareness and understanding. Meditation is a spiritual practice, done with a focus in mind, for example the breath. The goal of meditation is not relaxation. What you are working towards when you practice yoga and meditate is, ultimately, developing a suspended mind; observing and becoming aware of reality and consciousness, and the truth self. When students first begin their yoga practice, meditation as a spiritual practice leading towards ‘enlightenment’ can seem daunting, and they probably feel some doubt about their ability to ‘meditate’. Some might come to class wanting asana practice, but aren’t open to the practice of meditation because of their own belief system. Some are not interested in meditation. Some students bring their idea of ‘relaxation’ to class, and are confronted when the meditation practice is quite different to what they were expecting or hoping for. As teachers, we need to address these issues. First and foremost, we need to teach students about meditation. Students need to have a good understanding of what they are ‘aiming’ for, or trying to achieve. Perhaps the Christian student would feel more comfortable knowing that we aren’t asking her to turn her to pray or turn away from God? Perhaps the student who is there for the physical poses and exercise would feel more comfortable knowing that meditation IS yoga? And we need to emphasise that it is practice! PRACTICE! Maybe the student doubting his ability to meditate needs reassurance that there is no expectation for them to achieve enlightenment right here and now? If you are sitting in stillness, observing and becoming aware and training your mind, then you are having success. Yes, your mind will wander; of course it will, you are a student practicing meditation! Just like you do not step onto the mat and expect to be able to perfectly execute and hold a handstand the very first time you practice poses, you won’t sit in meditation and achieve a suspended mind the first time you practice meditation.